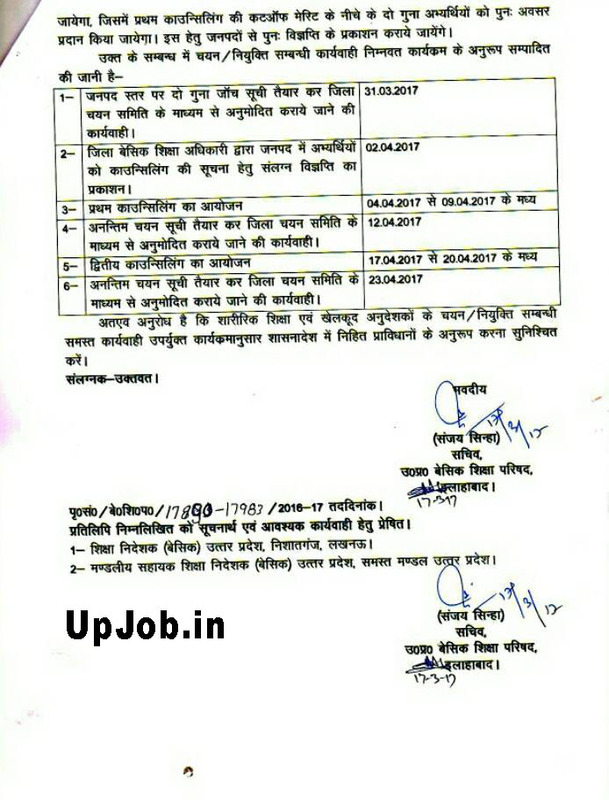 state government of uttar pradesh published the official Recruitment notification for inviting online application form for Anudeshak Bharti 2016 for government upper primary School (Uccha Prathmik vidyalaya). 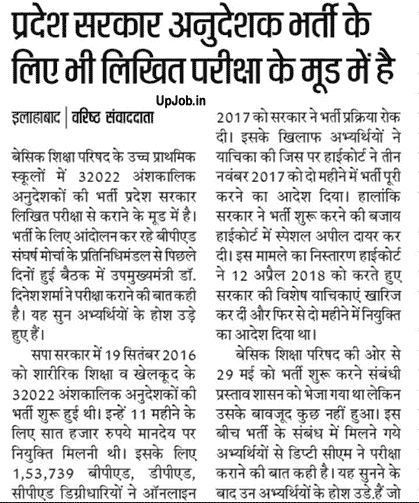 Last date of application form submission was 11 November 2016. government will publish official cutoff mark / merit lists / Results of UP Anudeshak Vacancy . Selection of the eligible candidates will be done on district level so merit list and Cutoff lists will be also published District level. Counselling of Anudeshak posts will be started from 31 March 2017. If you also filled application form for Anudeshak (Instructor) posts for Computer, Art, and Other Subject then start your preparation form appearing Counselling. UpJob.in will provide you complete details regarding Anudeshak counselling. Raj Pariyojana Nideshak (State Planning Director ) of Sarva Siksha Abhiyan (SSA) has given detailed instructor to basic Siksha Adhikar (BSA ) of Each District. Merit list / Cutoff lists will be published by Each BSA in local news paper in the 1st week of March 2017. cutoff merit list will be published in Dainik jagran , amar Ujala and www.upjob.in online website. you can download official GO published by Chief Secretary i for more details regarding anudeshak recrutiment. If date will be revised UpJob.in immediately inform you here . Selection of the eligible candidate for Anshkalik Anudeshak posts for parishadiya Uccha Prathmik Vidyalaya for the academic session 2016-17 on contract basic. A separate merit list will be prepared for Kala Siksha (art education) , Sharirik siksha (physical education ) and Swath siksha health education ( , and karyanubhav (work education ) . 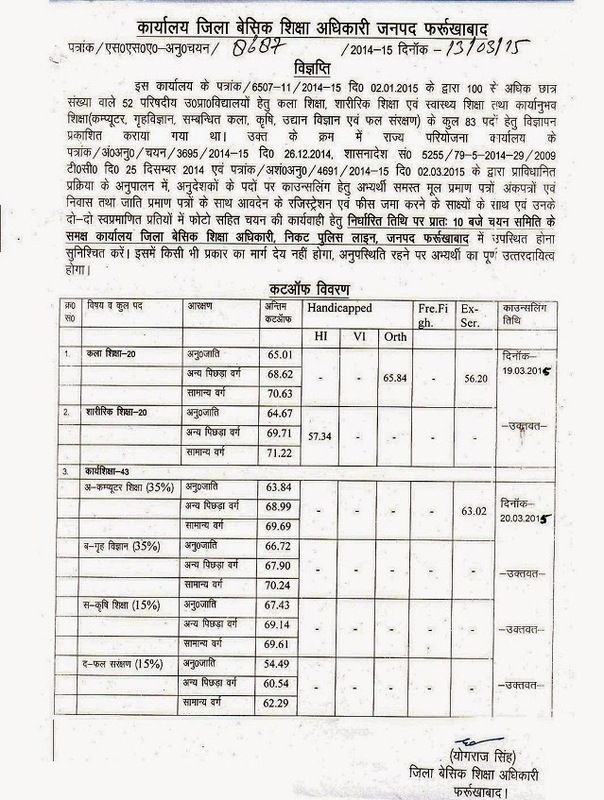 Selected Anudeshak will be appointed for 11 month contract on 7000 fixed honorarium . Leave /A Avkash for Anudeshak : maximum 10 days leave will be granted to each Anudeshak as a CL casual leave . if case for any other absent no herbarium will be payable. Your service may be terminated in case of unauthorized absence. Service period will be 11 month and contract period will be end on 31 march of each session however they will get salary till the 31 may of concern year. All of your original document will be deposited at the time of counselling and your will get a receiving in counselling regarding your submitted document. Keep safely this receipt because your document will be only return when you submit this receipt. After that final merit list / selection list will be published for those candidates who selected for joining / appointment.